My name is Rhonda and I am a traditional Catholic mom of two girls and two boys (ages 5 months, 2, 3 and 6), wife and artist. I have a BFA in Fine Art with an emphasis in Graphic Design. I have worked professionally as both a Designer and an artist before getting married and have children. 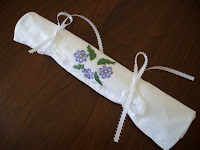 I love all things crafts and art, love to cook (especially love baking bread), sew and garden. When I started wearing chapel veils to Mass I was disappointed by the lack of selection available. Once I started sewing them for myself I decided I could help other women by making and selling affordable veils. Etsy seemed the perfect place to open a shop; the customers are so friendly and I love meeting women from all over the world who are also interested in veiling. Since I first opened, I've added other things to my shop as well... Catholic Art, Sacrifice Beads, Rosary Purses, Custom Made Nun Dolls as well as other items. During Advent my oldest daughter (6) and I make paper ornaments from old Christmas cards and sell them to raise money for charity. We call this our "Corporal Works of Mercy Project." As I mentioned before I am a fine artist by training. I love to paint flowers and other natural scenes in oil, acrylic, gouache or watercolor. I have a few of these paintings in my shop, but mostly right now I create and sell chapel veils. I love finding unique colors and textures of lace and then finding that perfect trim to finish it off. Then there are all the shapes to choose from. Usually when I find a lace that I like I buy several yards and spread it out on the work table (my dining room table -- more about this later) and let the pattern and texture dictate what shapes of veils will come from it. Its lots of fun making each one slightly different and unique and something that someone somewhere will love to wear. In a perfect world, Id have a real studio, and maybe someday when the kids are grown that will happen. Right now I create in different spots all over the house; the dining room has become my sewing room; when I paint, I use our sunroom; when I photograph my veils its most often in the living room on the end table. We do have a nice office in our home, which is where I do all the tedious computer work and where my drafting table resides (usually piled high with sketch books, to-do lists, bits of fabric, etc.). This is also where my husband and I run our other home-based business, Philothea Press, a small publishing company. My favorite devotion, by far, is the Holy Rosary. We say this together as a family every night and have been so blessed by it. Thanks for taking the time to read about me and I hope you'll stop by the shop and see my work! Hello fellow team members and visitors. 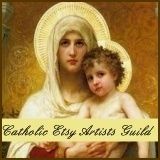 I am a proud member of the Catholic Etsy Artists. My name is Linda and I am the artist and owner of Cedar Creek Treasures. I joined the group in April of 2010. I am 47 years old, married almost 27 years. I have 2 children. A Daughter, 26 and a Son, 18. We also have a little dog who is like part of the family. I have credits in Marketing and small business. I worked for most of my life as a papermaking technician. In 2002, I quit my job and started my small craft business out of my home. I have been selling my work at Wisconsin Arts and Crafts shows for the past 8 years. I have also done many custom pieces for clients. When I opened my shop, I chose the name Cedar Creek Treasures. The name was chosen based on where I live. Behind our house is a cedar woods in which runs a creek. I love to create many different things which I call treasures. So, was born the name of my business! 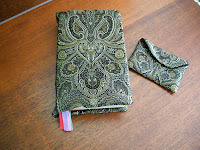 I set up my etsy shop and opened it with my first item listed in March of 2010. I wanted to bring my creations into the world of the internet. Many customers had suggested and asked if I sold my work online. So, I took the plunge! Was a bit scary, but exciting too! I was born and baptized Catholic. Unfortunately, my Mother died at a young age. I was about 1 year old. After my Mom's death, my Dad fell away from attending Mass. I always believed in God and prayed every day per the guidance of an Aunt. I was never taught the importance of the Mass. I attended Catholic school through 3rd grade and made my first holy communion. From 4th grade on I went to a public school. I did not attend Catechism classes. My Father obviously did not understand the importance of our faith. Losing my Mother at a very young age. He did the best he was able to do. I lived a very worldly life throughout my adolescence and adult years. My focus was mostly on my financial, material and physical well being. God was a smouldering flame in my heart. (That is buried in my heart. good thing he is a patient and merciful God) The good news is, he never gives up on us! On Sept 11, 2001 I had a reawakening to how I was living my life. I saw the events unfold live on television. I realized that the people going to work in the trade center that morning had no idea this would be their last day. I wondered what their relationship was with God. This led to me thinking of my relationship with God. I knew I was far away. I call this the day I was hit with a spiritual 2x4! I began attending Mass again and even started going to daily mass when I could. So began my relationship with God. This reawakening led to learning more about the faith through books and listening to CD's teaching the faith. The apparitions of Our Blessed Mother in Medjugorje also had a profound effect on my growing deeper in the Catholic faith I was baptized in. Medjugorje played a major role in my growth and relationship with the Lord. I went on a pilgrimage there in 2006. I now have a very powerful and close relationship with Our Lord, Blessed Mother, The Saints and the Angels. I pray always for the Grace to grow even deeper in relationship with the Lord and the church. I Love to find old things and reinvent them into something new. This is a great way to recycle! I use old door panels and cabinet doors. I crackle, distress and antique them to add to the aged appearance. Beautiful reproduction prints are then decoupaged onto the panels to create vintage look wall art. I also make petite wall signs with inspirations, using found wood whenever possible. The inspirations are heart-warming, and sometimes humorous. They come from scripture, the saints, something that touches me and sometimes are my own inspirations of the heart. My favorite quotes come from Mother Teresa. I call her my business partner. Prayer panels are becoming a large part of my collection. These are also made form recycled wood whenever possible. I also do some floral and wreaths with a victorian flair which will sometimes be included in my etsy shop. 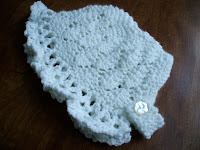 My online shop only have a sampling of the vast array of things I create. Here are some photos of some of my work. My faith is the center of my work. I do all my creating for the glory of God! God has given me the talent to create and touch people through this gift. I am his instrument. The work of my hands becomes a prayer given to him. Saint Terese gave God all of her works. This is what I do too. I like to follow her little ways! 5% of the profits from my sales go to various charities. Some that I have donated to are, Habitat for Humanity, A & A Alexandrina (local prolife pregnancy center), Mercy Home for Boys and Girls and Our Lady of good help. I have a great devotion to the Holy Face from "The Shroud of Turin". What I find so awesome about it is this is truly the face of Christ!! The Shroud has been scientifically studied and is not explainable. I believe it is the masterpiece of God!! I also have great devotion to Our Lady under the title "Our Lady of Guadalupe". Again, scientists studied the tilma and cannot explain why it has not deteriorated or how the image got there! I believe that is, because it too, is the masterpiece of God! I hope this helps you all to get to know me better, I look forward to meeting all of you! I started my Fiberfads! shop, which sells hand knitted items, as a way to earn money for Mary's Shelter, a local shelter for women facing a crisis pregnancy (www.marysshelterva.org). About a year later, my father, whose address was Grace Hill Dr., died a peaceful and holy death after a short but intense fight with cancer. It wasn't until after his death that I realized the significance of the name of that road. The ultimate Grace Hill was Calvary on which our Lord was crucified for the salvation of all mankind. My father imitated Christ on his personal Grace Hill by offering to God all his sufferings for a suffering world...Grace upon Grace through redemptive suffering which God allows us to share with His Son. So, in memory of my father, I opened my second shop, Grace Hill Gifts which sells handmade Catholic goods. I create anywhere I can find a seat to knit or sew. I do sell my Fiberfads! 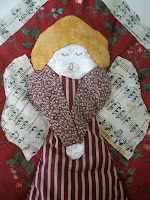 work for Mary's Shelter at a local farmer's market, but I only sell Grace Hill Gifts on Etsy or to friends. I have found a wonderful book on the Psalms so I have been praying a psalm a day and studying the parallel commentary.